Parkside Mansion is a luxury wedding venue with a perfect location overlooking City Park in Denver. Overlooking the expansive City Park, the venue has a rooftop patio to give a secluded feel in an urban setting. For a seated reception the venue can accommodate up to 150 guests. Amenities for the bride and groom include a large bridal suite with all the creature comforts needed, and a groom's room with fireplace - perfect to hang out before the ceremony and get ready. The Grand Ballroom includes a vintage chandelier and details, and another dining room that can be used for multiple purposes including for having the cake. As a photographer, I love the classic white columns outside and other older era features that make for awesome portraits. Not only that, but it's right next to the vast 320 acre green space of City Park, making it all the locations a couple needs for their portraits and bridal party photos. It's great to have some natural looking photos with an urban Denver wedding, as that can be hard to find close to a venue. In this wedding photo, the bride and groom made their grand exit from the reception. 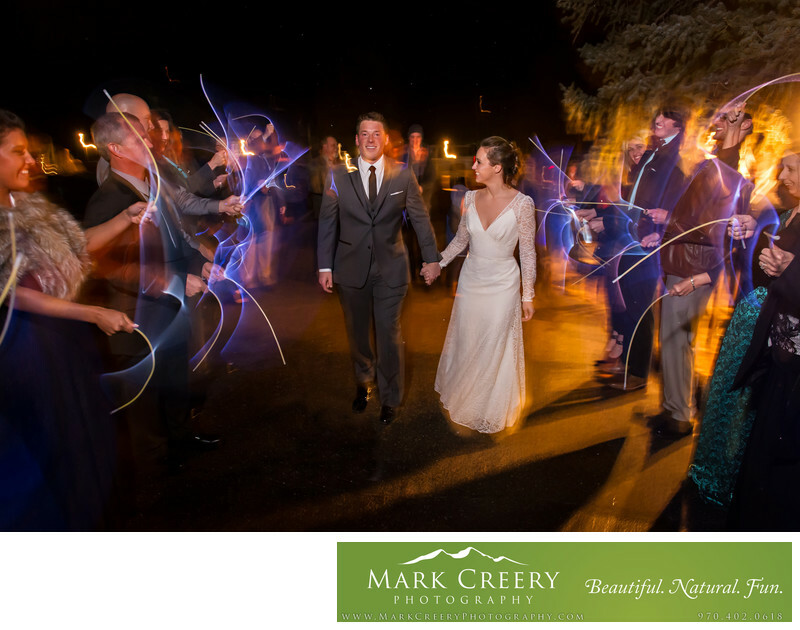 Their guests held long glow sticks which they waved around as the couple left. Glowsticks are a fun idea to try, as they don't require a lighter like sparklers, and so are easy to set up. They create unique and interesting light trails when the photo is taken at a long exposure, like I did here. The slow shutter speed I used helped to create some ambience in the photo. Parkside Mansion is located in Denver, Colorado. Contact: info@parksidemansion.com, (720) 328-9532. Location: 1859 York St, Denver, CO 80206.